In recent years, there has been quite a bit of talk around ozone in a commercial laundry setting. Many have tried to sell ozone as a one size fits all solution, solving all problems and completely eliminating hot water and chemical usage. While there is reduction in hot water and chemical usage, ozone will not eliminate hot water or chemical usage entirely, as ozone is only effective on water soluble stains. Coronal Discharge generates ozone through use of a high voltage spark using dry air and pure oxygen. The main advantages of this type of generation are the maturity and efficiency of the technology. 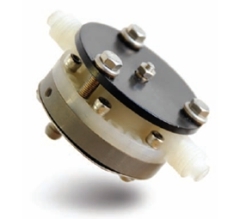 However, the disadvantages include unavoidable nitrogen oxide byproducts (NO and NOx), additional dehumidification is required, oxygen concentrators or pure oxygen source is required, and this method has a high initial expense and expensive replacement parts. Ultraviolet Radiation (UV) generates ozone using UV lights (black lights) and dry air. Its main advantages are its low cost, no Nitrogen Oxides are generated, it is not affected by humidity, and its low cost. Its disadvantages include very low concentrations of ozone are generated, it consumes more electricity than other methods, and periodic bulb replacements are costly and time consuming. Electrolytic ozone generation makes ozone through electrolysis. Direct Current (DC) is passed through pure water, breaking the water into hydrogen and oxygen. The main advantages are low cost, low voltage DC is used, it is not affected by humidity, and high concentrations of ozone are generated with very little off gassing. Disadvantages include periodic consumable replacement (3 years) and power must be applied at all times. 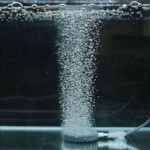 Aeration bubbles the ozone into the wash solution, which dissolves a small percentage of the ozone in the wash solution. The rest passes through the solution and into the air as ozone gas. The injection method uses a venturi to pull the ozone into the water and dissolve about half of the ozone into the wash solution. The remainder passes through and into the air as ozone gas. Nebulization breaks the water into very small droplets in order to maximize the surface area of the water and more effectively dissolve the ozone. The mixing pump pulls ozone and water into the pump body. The turbulence and pressure within the pump maximizes the amount of ozone dissolved in the water. Ozone systems are not a cure all for laundry problems, but have a place in the laundry toolbox. Depending upon the soil levels in the goods, an ozone system can be a very effective weapon for decreasing costs and increasing efficiency in the commercial laundry environment. The best application of an ozone system is one where disinfection of the goods is a high priority, or minimal soil/staining is present and the goods need only disinfection before being placed back into service. Typically, health care and hotels/motels are prime candidates for an ozone system. Use care, as there are many variables to consider when choosing an ozone system for a commercial laundry.